Images, pictures & photos of the late medieval Raglan Castle. Welsh, Castle Rhaglan), built by Sir William Thomas in the mid 1400’s in Monmouthshire, Wales. Raglan Castle was built as an impressive fortification by by Sir William Thomas. In the 15th and 17th centuries the castle was completed to become a luxurious fortified castle. 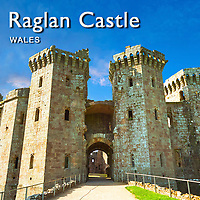 The use of hexagonal towers at Raglan have created a picturesque castle with an impressive keep, known as the Great Tower or the Yellow Tower of Gwent, surrounded by a sunken moat. The keep joins the extensive main castle building with its hexagonal towers. Even in its ruined state Raglan Castle is impressive and it can be seen that the rooms of the castle would have been well proportioned, airy and luxurious. Raglan Castle was built to impress and the design of its octagonal towers were probably imitate those of Caernarvon Castle. The end result created the "last formidable displays of medieval defensive architecture” according to historian Anthony Emery. Raglan Castle was one of the last castles of this style due to the emergence of the cannon, which rendered the high fortifications at Raglan redundant. This was proved during the English Civil War when the castle was taken by Parliamentary forces and slighted and its defences were taken down to put it out of action. During the restoration the Somerset family, who owned Raglan Castle, did not restore it and the castle became a source of building material and declined into the romantic ruin we see today.